If you give presentations, you'll welcome ZoomIt, a free program that lets you zoom in and draw on anything on your screen. It's exceptionally easy to use, and takes up practically no memory, so there's no learning curve, and no hardware issues. ZoomIt has simple-to-use presentation tools such as zoom and drawing. Once you've launched ZoomIt, simply press a hot key combination, and you'll zoom in. The launch combo is configurable; you can easily change if you find the Ctrl-1 default awkward. You zoom in and out using either a mouse wheel or the up and down keys. Similarly, you can draw on your screen by pressing a hot key combination and then using your mouse to draw. ZoomIt lets you change the width of the pen and its color, and if you'd prefer, you can also type on the screen. You can't save what's on the screen, though. 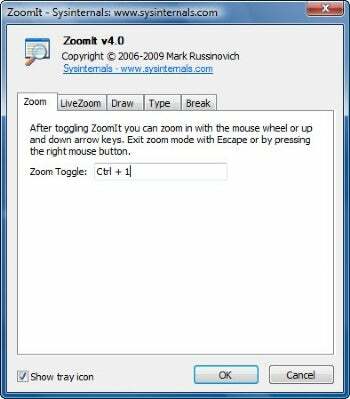 ZoomIt's developer, Mark Russinovich, wrote it because he frequently gives technical presentations, and it shows in his attention to detail. There's even a break timer that shows on the screen how much time is left until a meeting break ends.